When the weather forecast indicates a line of strong storms with potential tornadoes, straight-line winds and flooding is 24 hours away from you, what do you do? For many of us today in our fast-paced, busy lifestyles, that is when we may begin to think about what preparations should be made to our homes, churches and businesses. We hurry off to the store only to find no wood, nails, or generators remain. By this point the storm is just hours away, bearing down on us. What now? When a storm is a day or less away, YOU are too late to begin your planning. Now is the time to prepare for the next disaster. Now is the time to make sure your home, church or business has the needed supplies on hand. Preparation and readiness is the first key to surviving any disaster. If you feel called to serve as a volunteer for the Great Plains United Methodist Conference in one of the areas mentioned above, contact Rev. Hollie Tapley, disaster response coordinator, at htapley@greatplainsumc.org. After a disaster strikes communication at all levels is extremely important. Whoever learns of the disaster first is encouraged to initiate the call and all persons called make sure others in this list are notified. 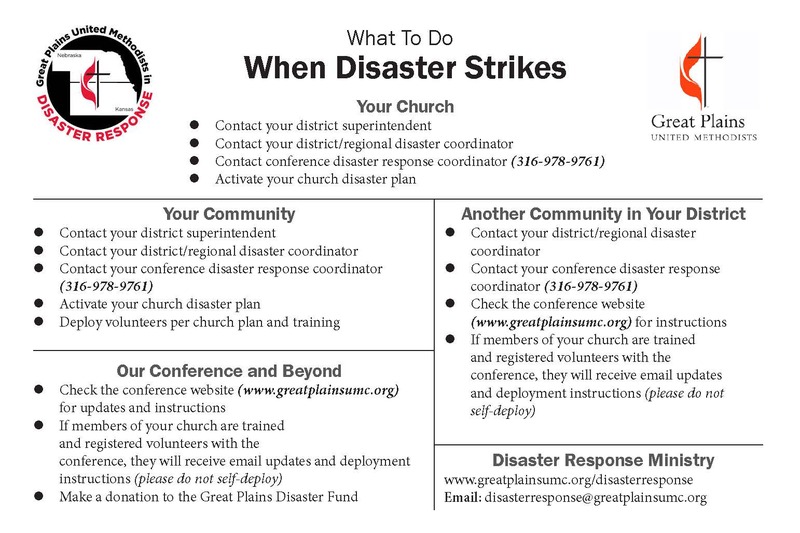 Read about how the Great Plains Conference responds to disasters, including what kind of help we offer, who responds, how long we are involved in recovery, and more. Photos: On May 11, 2014, tornadoes hit south central Nebraska, causing major damage to communities such as Beaver Crossing, a town of about 550-600 people where almost every house was damaged to some degree. 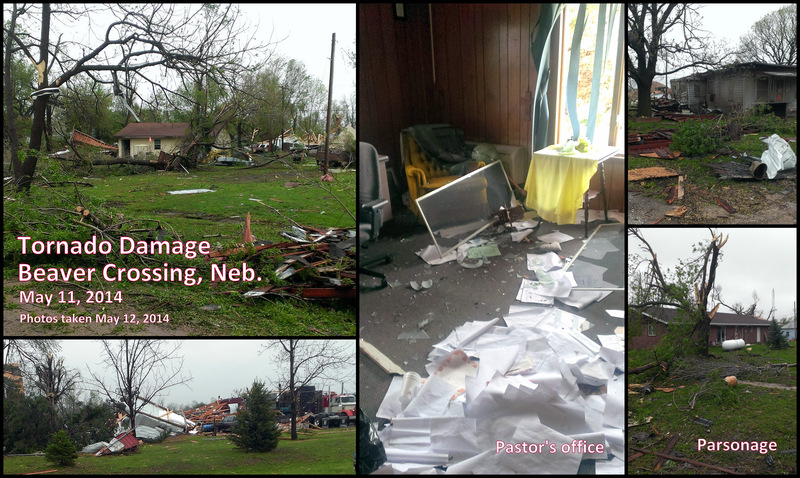 The United Methodist Church and the parsonage in Beaver Crossing received extensive damage, and the homes of several church members were destroyed. The church basement sheltered about 20 people during the storm.